Is this food a good bet? I teach a course at Bastyr University called "Whole Foods Production." In the first class, we sort out all the relevant terms, including the tricky phrase "whole food." What criteria do we use to define a whole food? Because before we put a bite in our mouths, there needs to be a moment, a pause, when we consider where the food came from. What was its life like before it came to be on this grocery-store shelf? Packaged foods can be pretty mysterious. To figure out whether a food is a worthy of going in your grocery cart or brought to your lips, ask yourself these questions. h4. 1. Can I imagine it growing? I grew up in Kansas, so I sure as heck know what wheat fields look like. 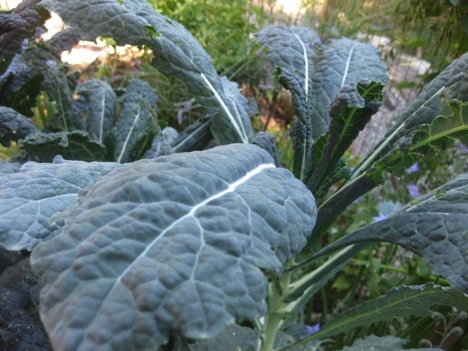 And right now I have so much kale growing in my garden, I’m going to need a small army to harvest it all. But I’ve never seen a stand of Cheetos, or a stream of diet soda. If the item is so far removed from its original source that you can’t picture where it might come from in nature, put it back on the shelf. h4. 2. How many ingredients does it have? A whole food has only one ingredient: itself. No ingredients label is necessary on simple foods like fresh apples, river trout, and wild rice. Of course, what about something like bread? If all of the ingredients are made from recognizable whole foods — yeast, whole-wheat flour, water, salt, honey — that loaf can be considered a whole food. But if you have to squint to read 13 lines of tiny print on the plastic wrapper, put the loaf back on the shelf. h4. 3. What's been done to the food since it was harvested? Answering this question is a tall order in some cases. Of course, if you strolled through the farmer’s market and selected a beautiful brainy head of cauliflower as you chatted with the farmer, well, case closed. But if you’re staring at a tub of something that promises to resemble butter but isn’t, put it back. The less that has happened to the food since it was harvested, the better. Read the list of ingredients on the labels; if you can't pronounce an ingredient or can’t imagine it growing, don't eat it. If it isn't something that you could possibly make in your own kitchen or grow in a garden, be wary. h4. 4. Are all of the edible parts of the food present? Juice is only a part of a fruit. Oil is only part of the olive. When you eat a lot of partial foods, your body in its natural wisdom will crave the parts it didn't get. Try it yourself. Drink a pint of carrot juice and watch what you want next. My guess: a muffin! Because you left the fiber in the juicer. And if you choose a white-flour muffin made with a lot of sugar, you’re still going to be left wanting, because all you gave your body was empty calories. h4. 5. How long has this food been known to nourish human beings? Sounds tough, but my criterion is a thousand years. OK, maybe a few hundred. Be skeptical about putting something on toast or in tea that the FDA just approved last month. Time and again, the rush to put a new drug, supplement, or food additive on the market has had questionable long-term effects. Most foods worth putting in your body have made appearances on cutting boards and dinner tables for centuries. Finally, here’s another version of me from Cookus Interruptus explaining those five questions, plus one more: "Where’s Joaquin?"